Her heart found the forgotten, her faith found a way. Wow, what a nice story what a nice movie! It exceeded my expectations. Most "religous" don't have the funding for first-class production values, but this one must have because it looks great. That beautiful photography throughout the 115 minutes was one of the two biggest reasons I enjoyed watching this. The other was the number of profound truths said by Mother Teresa (Olivia Hussey). This was an inspiring film with some great statements. By the way, those production values included decent acting, too, at least by all of the adults. Some of the kids were so-so, but they didn't have many lines anyway. 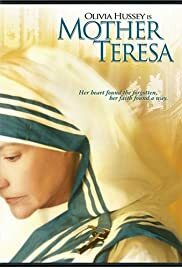 What I appreciated what that the filmmakers did not water down the Christian aspect of Mother Teresa's life. Everything she said and did was for God's glory, as she states several times, owning trying to please Jesus. Obviously, she succeeded like few others have with an amazing compassion and selfless attitude. There is no ego here, no pride, only what she can do for the sick and poverty-stricken. This movie can be enjoyed by all. You don't have be a Catholic. I'm not, and I have total respect for Mother Teresa and cannot find fault with anything she said or did. For Believers, this should inspire them to act a little more Christ-like. For non-believers, this story is a great example for anyone who simply needs a nudge to go help someone less fortunate. There is no heavy-handing "preaching," either, for those concerned about that matter. This is simply a quality film about an extremely quality person whose life should inspire all of us to become better people. This film did a great job in that respect.